Ribbon-cutting at the Haddon Towne Center project. From left: Jorge Berkowitz, Bob Martin, Randy Teague, Art Corsini. Credit: Matt Skoufalos. 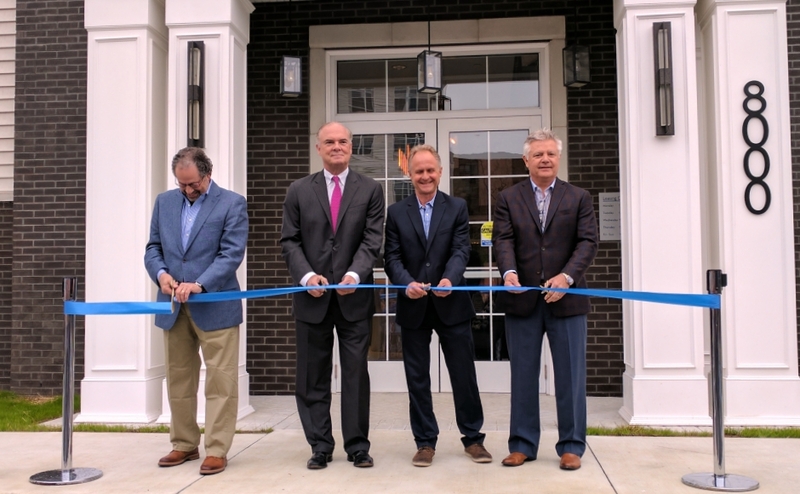 As the first tenants moved in, state officials praised the 252-unit, mixed-use construction as an example of adaptive reuse of the formerly contaminated Dy-Dee Diaper Wash facility. Interior view of the Haddon Towne Center complex. Credit: Matt Skoufalos. It’ll be another year yet before the 252-unit Haddon Towne Center project fully wraps its redevelopment of the former Dy-Dee Diaper Wash facility in Haddon Township. 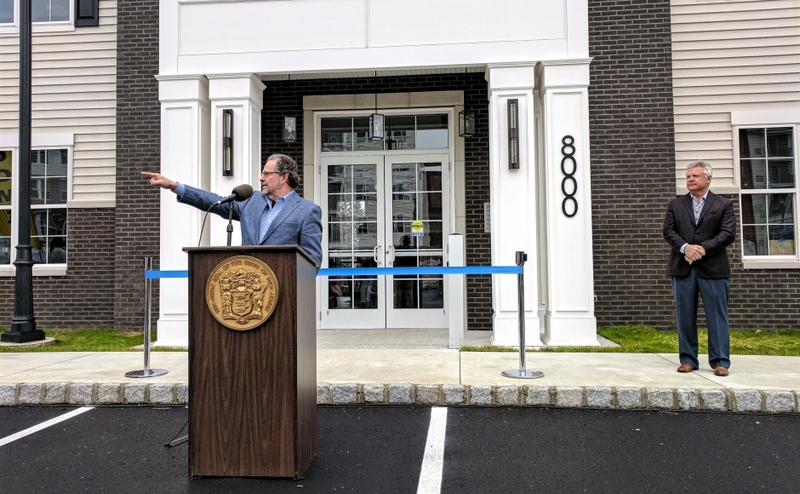 But after 14 years, and with the first of its tenants starting to move into their new, Haddon Avenue addresses this weekend, state and local government officials were more than willing to celebrate a job mostly well done. 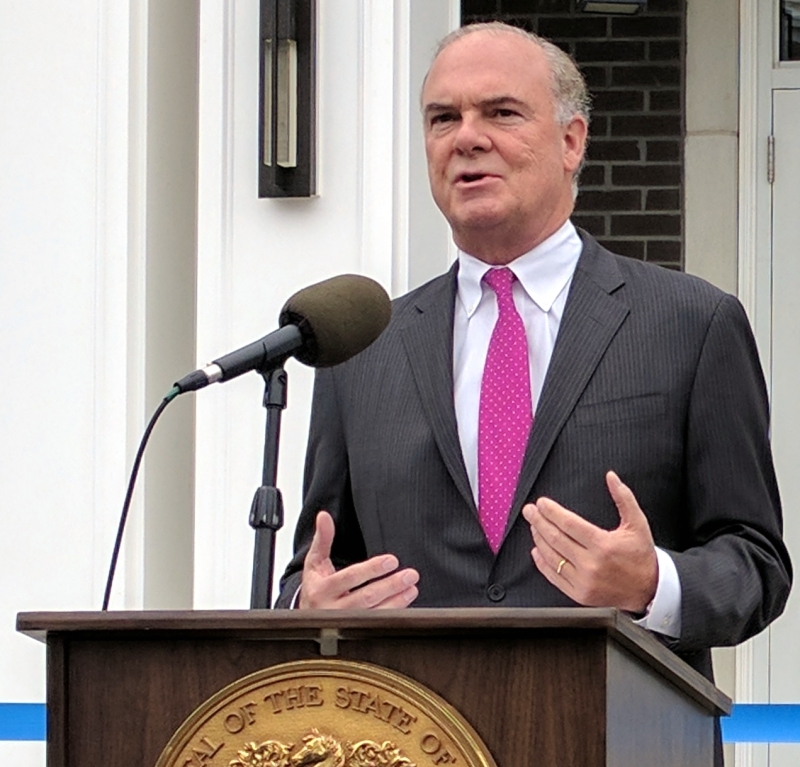 Calling the project “a poster child for success in partnership” among multiple levels of government and private enterprise, New Jersey Department of Environmental Protection (NJDEP) Commissioner Bob Martin credited its principal players for their resilience in seeing it through. NJDEP Commissioner Bob Martin. Credit: Matt Skoufalos. Fieldstone won not only $3.5 million in NJDEP site remediation grants but also a 30-year, $15-million local PILOT agreement to help offset the cost of the $38-million project. New Jersey has issued more than $111 million in grants and licensed 641 site remediation professionals for brownfield redevelopment since 2010, Martin said. In that time, the number of brownfield sites has fallen from more than 26,000 to 14,000, at least 30 of which are actively being studied in Camden County. “Long-term redevelopment changes and revitalizes communities overall,” Martin said. At first glance, senior consultant Jorge Berkowitz of Langan Engineering joked that he’d told developers from the Fieldstone Group that the Dy-Dee site could be cleaned up “in two years max. Jorge Berkowitz (left) and Art Corsini. Credit: Matt Skoufalos. With only 5 million acres of land in New Jersey, “We have no option but to reuse sites that have been contaminated,” Berkowitz said. Haddon Township Mayor Randy Teague cited compromise as the key factor in completing the project amid various complications, from the acquisition of 17 individual properties to the collapse of the real estate market to an extended legal battle with Fair Share Housing over its affordable housing quotient. Compromise was indeed an inherent part of the mixed-use project, most notably in the 20-percent affordable housing obligation, which wasn’t an original part of the redevelopment plan. Neither were its first-floor residential units, which appear nowhere else in the Haddon Township central business district, and which weren’t stepped up from street level in the design. View of the PATCO Speedline from the 1000 building of the Haddon Towne Center. Credit: Matt Skoufalos. As a mixed-use project, the complex offers 12,000 square-feet of retail space—less than half the 25,000-square-feet in its original plan. 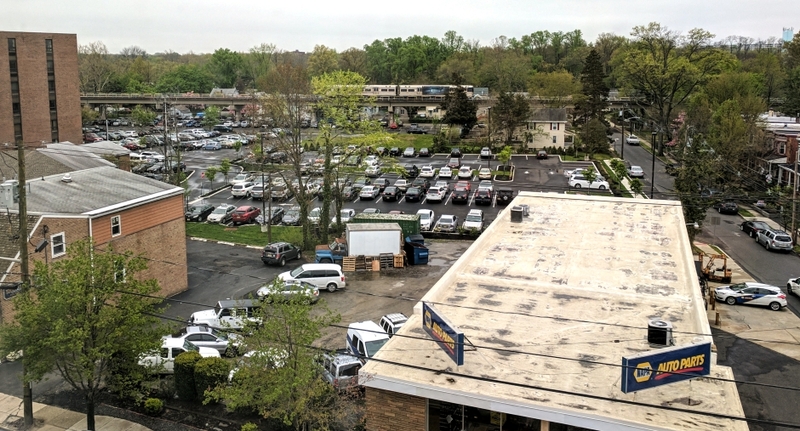 And although it’s advertised as a transit-oriented development (TOD) for its proximity to the Westmont PATCO Speedline station, the project has a 1.7-parking-spaces-per-unit ratio that is far higher than those in nearby TOD’s like the Collings at the Lumberyard (0.9 spaces per unit). 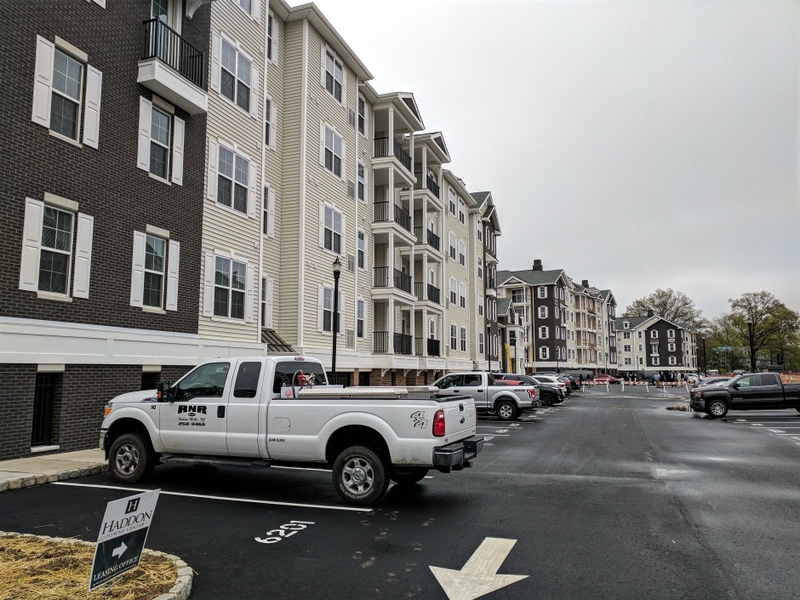 Several of the buildings are already open or have been scheduled for leasing, said Fieldstone principal Art Corsini, adding that property managers have 70 signed applications in hand. All the one-bedroom units in Building 1000 have been rented, and more are scheduled to be released in the 2000 building, which is pre-leasing for a July 14 opening. The 4000 building is on track for an October opening, and the first tenants in the 5000 building will move in this weekend, Corsini said. From left: the Haddon Towne Center clubhouse and in-unit views of the Agatha Christie and F. Scott Fitzgerald models. Credit: Matt Skoufalos. Bellmawr native Rick Ragano was among them. Ragano, who owns a commercial cleaning business, said he became interested in apartment living after visiting a similar community in Glassboro, where his sister lives. “I loved it there, but there were no stores and restaurants,” Ragano said. Corsini said the project has integrated well into the surrounding community, and cited next-door pizza bar Treno as having been “a good neighbor” throughout the construction. Corsini, who once lamented the darkened storefronts in the Haddon Township downtown, said he’s been “pleasantly surprised” at the volume of business along Haddon Avenue, to which the center is expected to contribute eight more tenants. Restaurants have expressed interest in the end caps, and a day spa is likely to take another, he said. 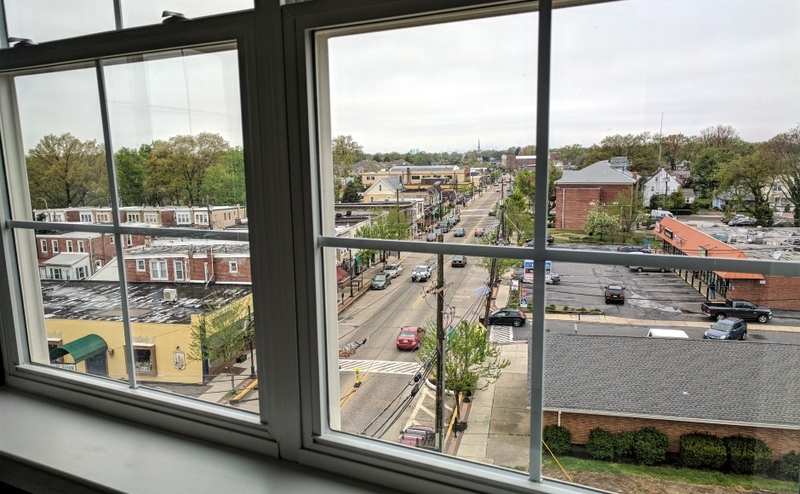 View from the fifth floor of the 1000 building of the Haddon Towne Center. Credit: Matt Skoufalos. 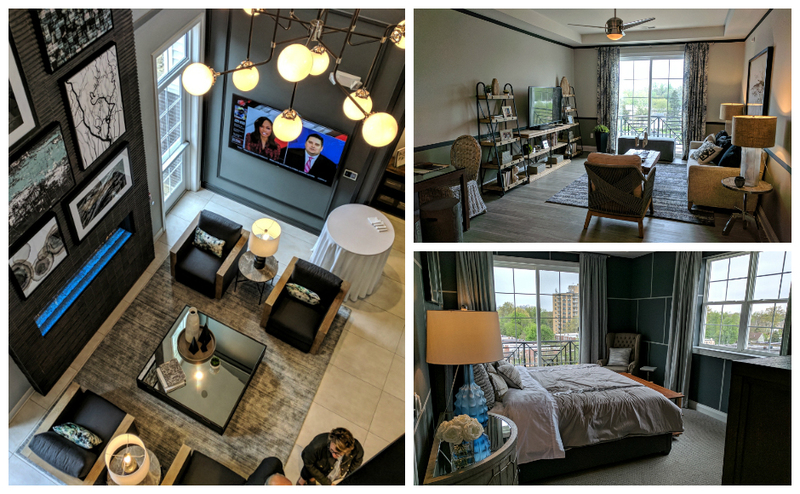 Floor plans are named for famous writers like George Orwell and Ayn Rand, and range from 833 to 1,414 square-feet apiece. Market-rate units rent for $1,500 to $2,600, excluding utilities. They are appointed with contemporary amenities, like laminate floors, granite countertops, and high-efficiency laundry machines. Several feature balconies, some offering expansive views of the Haddon Avenue downtown that stretch out to Philadelphia on a clear day. For Teague, it’s the arrival of the tenants who will fill those units that is the biggest metric of its success. The site is no longer a dirt lot, unlit and abandoned, but will provide new life for a downtown that has rehabilitated several landmark properties in the past few years.